Call one of our Return Specialists at (877) 885-9009; Monday–Friday: 9 am – 5 pm Eastern Time). Please provide your Customer ID, your Invoice No. (found in the top right corner of your invoice), and the reason for the return. 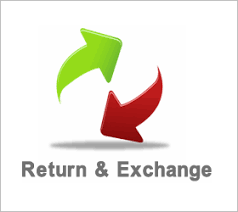 The Return Specialist will give you a Return Merchandise Authorization (RMA) number and an address for the return. All items sent back without an RMA# will be refused and returned to sender. All eligible products (exclusions apply) can be sent to SimplyCopper, Attn: Returns, using the address provided to you by the Return Specialist. Clearly write the RMA number on the outside of your package, preferably in the lower-hand corner of both the top and bottom of the box. Returned products must contain all original documents and materials. You may ship your returns via FedEx, UPS or USPS. You are responsible tor the return shipping costs. Be sure to keep your tracking number to ensure we receive the product. We are not responsible for lost return shipments. After we have received and approved your return, you will be credited the refund on the credit card or method of payment used to purchase the order. There is a 15% Re-stocking fee on all straight returns with no exchange. Your refund will be processed within 14 days of receipt of your return, assuming the item and its packaging are in their original condition. Payment will be credited back to the original payment method. ● Items must be returned within 30 days of delivery. ● Refunds will only be issued for unused item(s). SimplyCopper will waive the Re-stocking fee if you are needing to exchange a copper sink. Please call (877)- 885-9009 EST for exchange options . Please notify SimplyCopper immediately upon receipt of any damage to the product. Keep all packaging materials for inspection. We will require photo documentation of any damage to both the item and the packaging to proceed with a claim. Our carriers require that damages or shortages be reported within three (3) days of receiving the shipment. If these terms are not met a return may be denied.